There are all kinds of reasons a writer might shy away from trying to be funny. Humor can easily fall flat. Taste in humor changes over time and by region. Maybe the biggest challenge to a would-be writer of comedy is gathering the self-confidence to deliver the goods. 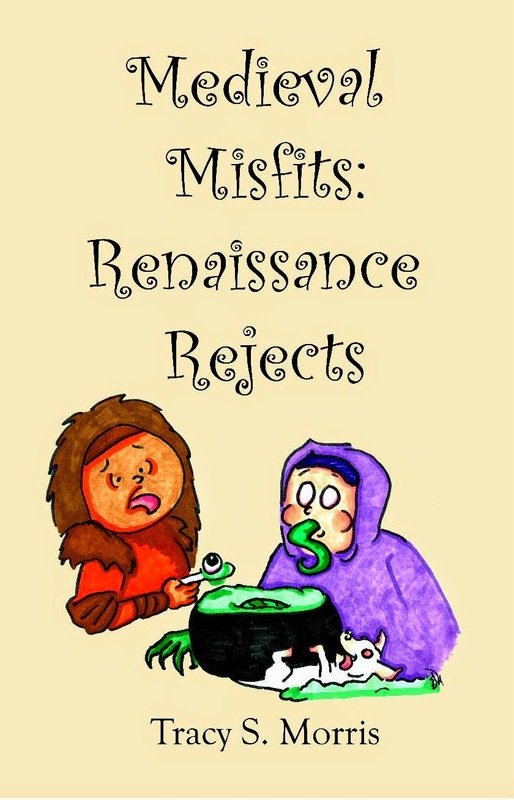 Tracy S. Morris, author of Medieval Misfits: Renaissance Rejects, offers some guidance and perspective. Remember in the early 90’s there was a Barbie doll that talked? Mostly she complained about how math was tough? (You don’t? Then get off my lawn you young whippersnapper!) Some days I think that Barbie knew nothing. Math is easy compared to writing comedy. Case in point: If you were paying attention to the news recently, you probably saw something about the brouhaha surrounding Stephen Colbert and #CancelColbert. If not, let me explain to you as if you lived your life at the bottom of a well. Stephen Colbert is an actor with a show in which he pretends to be a conservative news anchor. His show lampoons, among other things, pop culture, pundits and conservative news anchors. Things for Colbert were pretty much rainbows and puppies and Peabody awards until someone at Comedy Central tweeted out one of his punch lines without context on twitter. As a result, hashtag activists protested by tweeting out #cancelcolbert. Even after Colbert explained the context of the joke, some people still didn’t find it funny. Which just goes to show that humor is highly subjective. What one person finds funny, another person will be horrified at. When I was younger, I listened to a radio show called Dr. Demento. Most of the songs were hilarious. But there was one song that just made me sad. It was called Dead Puppies Aren’t Much Fun. To me, this song wasn’t any fun. Similar songs always at least rated a chuckle or two. Like the one about poisoning pigeons in the park. But not songs about dead puppies. Why? Maybe because pigeons are funny, and puppies are cute? Perhaps life experience, empathy and age all play a factor. Looney Tunes, particularly the older ones, don’t always hold up well either. If you put on a collection of older Looney Tunes, you may read a disclaimer that states that the shows are products of their times. This is boilerplate legalese that basically means: people in the 30’s 40’s and 50’s didn’t get offended at the same things you do. If you find Speedy Gonzales offensive, don’t watch! Racial stereotypes aren’t the only area where Looney Tunes don’t always age well. The old WB cartoons have always been liberally peppered with pop culture references. This was fine for the time. But nowadays even some adults who find them on Youtube may not recognize Frank Sinatra. So as a humor writer, how do I write something that has a broad appeal to the largest number of readers? Mostly, I just write what I find funny and hope that my audience shares my sense of humor. There is room in the world for all types of humor, from people who appreciate Buster Keeton to those who like Bevis and Butthead. And maybe even a few who think Barbie is funny, too. You can learn more about Tracy S. Morris on her website. You can purchase Medieval Misfits on Amazon and directly from the publisher, Yard Dog Press. Pehaps the biggest challenge of writing historical fiction is balancing fact and invention. Today's guest, author of the REALM series of historical novels, discusses this issue. between writing a good story and getting the historical details correct. It is a balancing act to share one character’s foibles and flaws, as well as the qualities about him, which we admire. For me, I like to add another element: to mix in “modern” issues the reader might not expect in an historical novel. A Touch of Honor is the seventh book in my highly popular “Realm” series. The Realm is a fictional covert group working under the auspices of the Home Office during the Napoleonic War. Each of the members of the Realm has left the service and has returned home to claim titles and land and, hopefully, love. However, a Baloch warlord, who believes one of them has stolen a fist-sized emerald he wants, returned to his land is pursuing them. For “modern” issues, the characters have met a variety of concerns. In The Scandal of Lady Eleanor, Lady Eleanor Fowler knows a deviant parent, who has placed her in a tenuous abusive situation. In A Touch of Mercy, we see how far a family will go to marry off their daughter to a man of wealth and consequence. In A Touch of Love, cultural assimilation in Regency London is part of the plot. In A Touch of Honor, the reader encounters the idea of “eating disorders” in a time when women were corseted into their dresses, as well as dependency on laudanum, a tincture of opium administered to babies and adults alike during the Regency and Victorian periods. Into these story lines, I have mixed the history of the time. The reader will discover something of the glass cones, a 19th century structured used in the glass manufacturing process, in A Touch of Cashémere. The Peterloo Massacre plays a part in both A Touch of Love and His: Two Regency Novellas. Lord Sidmouth’s search for sedition in post Napoleonic London becomes part of several plot lines. The reader has met such real-life characters as John Loudon McAdam, who developed the road system, which changed the face of England, as well as Sir Walter Scott as a close friend of one of the characters. One can also find the Pentrich Rising as the backdrop for A Touch of Love. The list is lengthy and diverse. Learn more about Regina Jeffers on her website and on her blog. 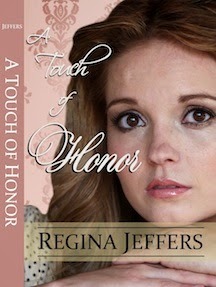 Purchase A Touch of Honor at Amazon and Barnes & Noble.